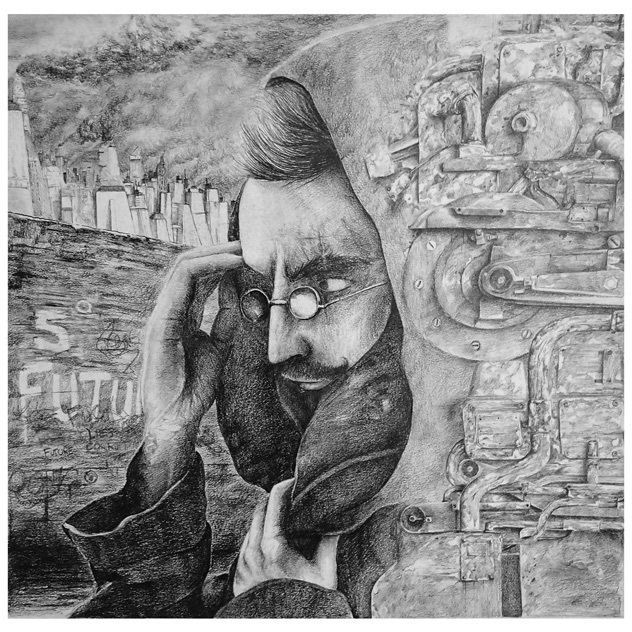 SCB, Old Media, New Society is available on Vinyl and Digital, featuring an original illustration by Jonathan Lawrence. A few weeks ago I was asked to get involved in an exciting new project from Dj and producer Scuba, creating the artwork for SCB. Scuba, real name Paul Rose, is famous for his highly regarded Hotflush record label, a former Berghain resident and a Fabric regular, he is an artist who is always moving forward creatively. His SCB alias was coming back with an idea that included a dystopian narrative, touching on prevalent themes like climate change and overpopulation. "Like many people, I've spent a lot of time this year thinking about the paths we could be headed down over the next few decades, many of which seem to point to catastrophic scenarios in society and the environment which were unthinkable until very recently." "One of the things that interests me the most is considering the journey of consciousness that leads people down paths which subvert their own previously held political morality." "Musically, this has been a slightly different way of working for me, but it's also been one of the few positive ways I've found to channel my attempts to make sense of our recent past and possible future." The music is more industrial, with a dystopian aesthetic. It has a dark future quality to it, you can almost hear it echoing inside turbine halls and factories. I was into it from the start, both from a sonic point of view and from the ideas Scuba had for the story. We started with a photo shoot, which gave me some reference material to base the main character on. This character, although loosely based on scuba, is not him. This man is a number, a victim of a system which punishes the wrong genetic code with forced labour and persecution. He lives in a world where the cities heave under the weight of overpopulation. There isn’t enough to go around, poverty is growing. 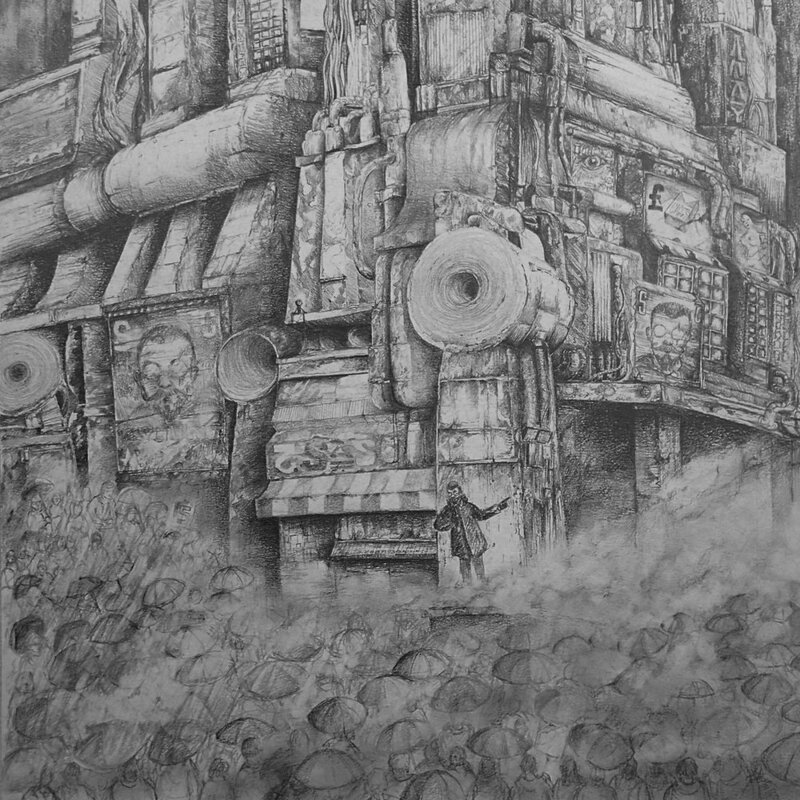 The world chokes from the fumes of high rise factories and industrial technologies. Fossil fuels have not run out, the companies that extract them thrive, this world has never made the transition to renewable energy. Capitalism spirals out of control, selling things the people can’t afford, creating debt and fear. I wanted the artwork for this EP to introduce this underground dissident and a little of the world he inhabits. The focus is on him, a mysterious character with an industrial past who has ideas of how to turn the tide, how to “fix” the world. It’s up to you how you interpret him and what his ideas may be and I look forward to developing this character and his dark future over the next few SCB releases. 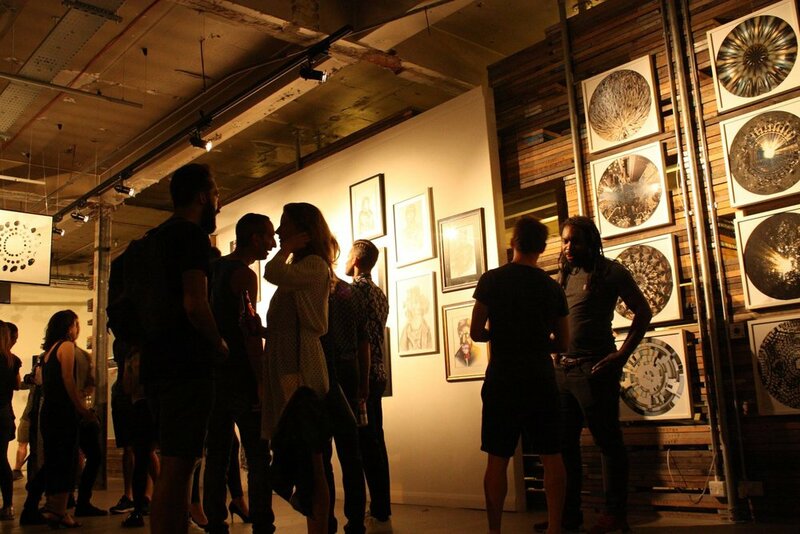 Last week marked the end of the Constant Circles second birthday exhibition. 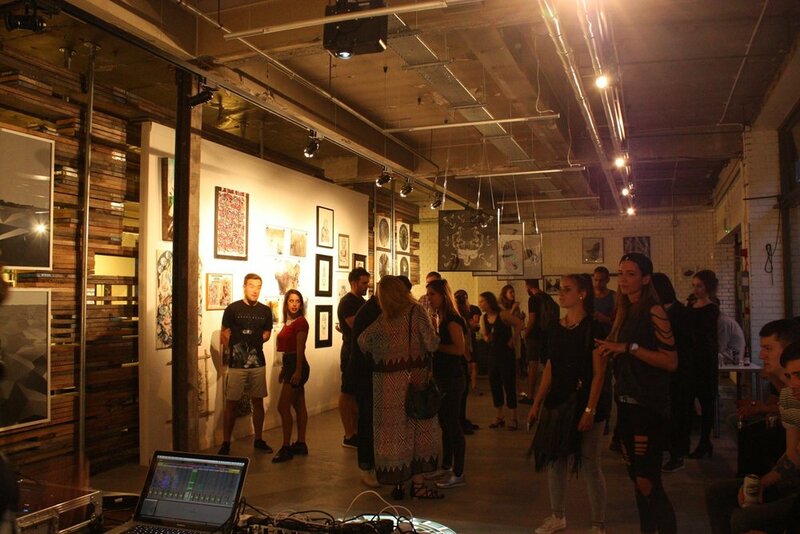 The show featured artwork from the likes of Unknown, Martin Vidal, Yvonne Cilia, Eyal Schwartz, Factory Fifteen and Sumski. 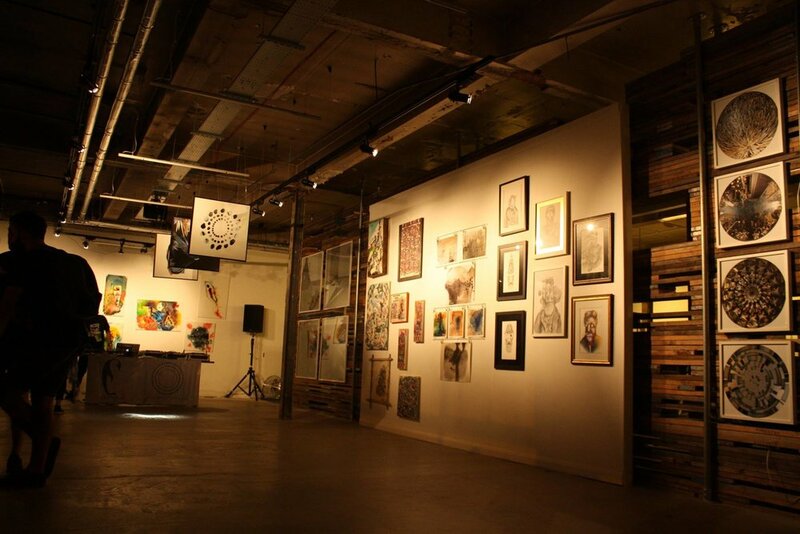 The exhibition took place at Factory Fifteen’s Gallery in Elephant & Castle and was my first show in London. It was a huge buzz to be a part of and I would like to thank everyone who came down on the opening night and the following couple of weeks. 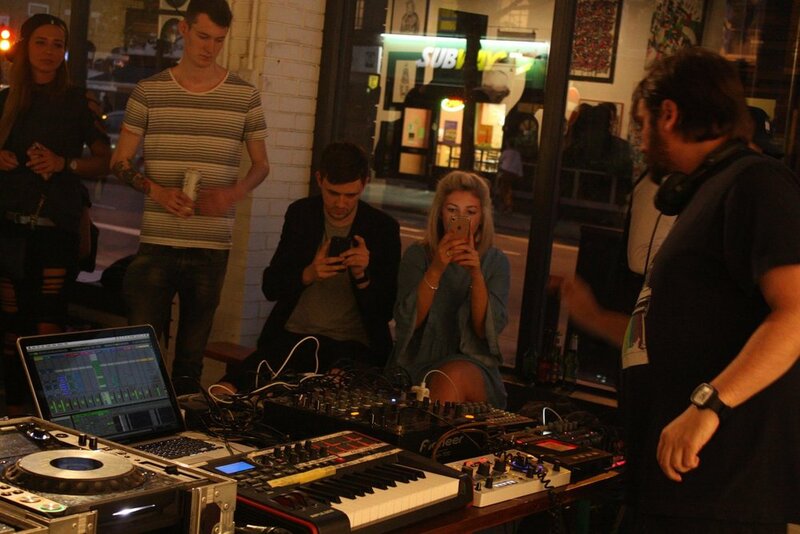 Here are some pictures from the opening night which featured some great music from Just Her and Saytek. Whilst browsing Instagram earlier I came across something that instantly set my excitement levels soaring. Being a huge fan of James jean and everything blade runner (by far my favourite film of all time), when this image popped up on his feed I nearly burst. Whatever it is in aid of sign me up, send me the bill I want it! Poster, book, concept art I don't care this is just borderline perfection in my eyes. If you aren't familiar with James Jean I suggest you follow him on instagram and visit his website, this guy is the real deal. Constant Circles Exhibition in Brighton - A crazy week! It's been a bit of a crazy week. A last minute press event on Tuesday (more on that to come) and last minute preparations for constant circles. Working on new pieces has been pretty much my whole life since coming back from India in March and it nearly all came to nothing when I received a message telling me that No Walls gallery had double booked us. They have since repeatedly apologised for the mix up but it doesn't alter the fact that this was a mistake that has cost us. This is pretty much par for the course when it comes to creative ventures. My whole life I've been let let down, rejected or had to face up to incompetents at every level, including my own, il admit that. For some reason I had faith that it would still happen and, as I write this sat on a train headed to Brighton, thankfully it's still on. The exhibition is currently taking place at Dynamite Gallery until the end of today, get down there and enjoy some great art! I will be exhibiting my work at the Constant Circles Art Exhibition and Music Showcase on the 27th & 28th April in Brighton. Constant Circles is a label run by a friend of mine, Just_Her aka Claire Spooner. I've released music on her label in the past as well as providing an original piece of artwork for it (which will be on display at the exhibition). There will be original pieces for sale as well as prints. I will also be spinning some tunes at the event on Thursday, bringing REbEL out of retirement for a bit! Constant Circles presents a showcase of underground music and visual art, in association with the Brighton Music Conference, & our friends Pavilion Clothing & Factory Fifteen. 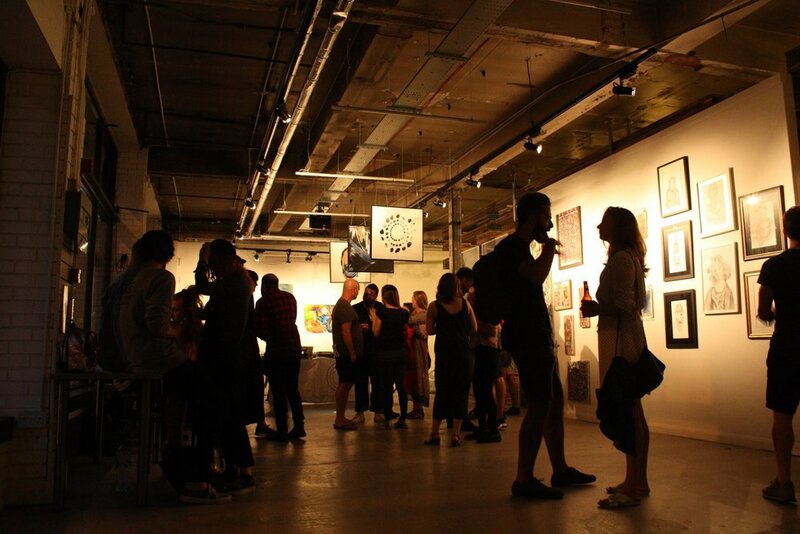 During the daytime on 27th & 28th April, we take over both floors of the No Walls Gallery in Brighton, with a curated selection of cutting edge contemporary art & underground music from label artists & friends. Visual Art Exhibition featuring Martín Vidal, Yost, Jonathan Lawrence, Šumski, Eyal Schwartz. April 27/28 11am - 7pm. No Walls Gallery, 114 Church St, Brighton BN1 1UD.